A duo of satin silk stripes on a ground of silk & linen. It's that addition of linen that does it...makes this a wonderful tie for warmer months, when the evenings are long, and shadows longer. 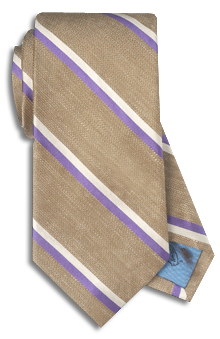 But please note, linen is linen, so this tie will not be as "smooth" as your all-silk ones. Handmade.